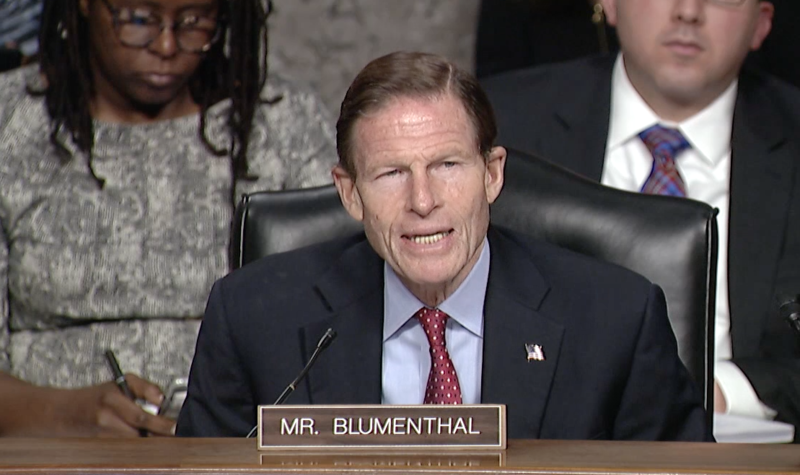 Later, at a Senate Commerce Committee meeting, “Winning the Race to 5G and the Next Era of Technology Innovation in the United States”, Senator Blumenthal brought up the question of scientific evidence of the safety of 5G. He stated, “I believe that Americans deserve to know what the health effects are. Not to prejudge what scientific studies may show. They deserve also a commitment to do the research on outstanding questions….How much money has the industry committed to support independent research?…has any been completed… on the biological effects of this new technology?” Industry representatives replied, “There are no industry backed studies to my knowledge right now.” Senator Blumenthal replied, “ so, we are flying blind here on health and safety”. There was no mention of public safety or environmental concerns aside from that brought up by Senator Blumenthal. The lengthy but enlightening full video of the Senate Commerce Committee meeting is here. The Feb 6 Commerce Committee meeting was focused on “key steps to maintain U.S. global leadership in next-generation communications technology, spectrum needs to accelerate deployment, and new applications and services consumers can expect with 5G deployments.” The hearing also examined current efforts to modernize infrastructure siting policies and the security of 5G networks to grow the digital economy, described as a “trillion dollar opportunity”. It was mentioned that 5G with quantum computing and artificial intelligence is needed to unleash the national agenda including national defense. Ms Cantwell stated early in the meeting, this will “will reshape the economy of the future” and “change our modern warfare creating military advantages through integrated military operations.” She also expressed deep concern for cybersecurity issues with this technology. The FCC has issued Policy Ruling FCC 18-111 to speed deployment of “small cells” which went into effect January 14, 2019 and required cities to update their wireless facilities siting policies to allow for administrative permits only for “small cells”, not the usual careful process for placement that requires planning commission and city council hearings. The FCC Ruling allows batched permits (dozens of permits), a rapid turnover for approval of 60-90 days and a cap on what cities could charge for rent per pole of $250 annually. The telecommunications industry says it will save about $2 Billion but the cities state it will be taking away that money needed for vital city infrastructure. Congresswomen Anna Eshoo and Speier introduced HR 530 to revoke the FCC Order and Ruling order. There are now 9 Co-Sponsors for the bill (Speier (CA), Bonamici (OR), McGovern (MA), Swalwell (CA), Suozzi (NY), Grijalva (AZ), Blumenauer (OR), DeSaulnier (CA), Huffman (CA). If you wished to comment on this issue you can send a letter to the senate commerce committee addressing only the issue of 5G by Feb 20, 2019. They need to be addressed only to REEDCOOK@COMMERCE.SENATE.GOV. Comcast, Intel to Redefine Home Connectivity, New Immersive Experiences.